Parents are an Olympic reporter’s gold mine, or anyway something like a lifeline. They are not what anyone would term an unbiased source, of course, but they can tell you what’s human about the superhuman athlete they’ve raised and shed light on their athlete’s otherwise invisible life away from competition. Their presence and their perspective is how reporters can justify the cost of a plane ticket to Korea to editors—a game story is better, richer when it’s imbued with scenes of parental nerves or recreated conversations. I met the Marino family on the morning of the first-ever Olympic snowboard big air qualifiers. I didn’t go looking for them. In fact, I’d never heard of Julia Marino before this week, which admittedly says more about me and the mainstream coverage of snowboard than it does about Julia, a very accomplished competitor who won X Games gold in 2017 and silver in 2018. The Marinos were easy to spot with a crew of 10 people holding up a big WAY TO GO, JULES banner alongside an American flag with the names of all the Team USA snowboarders written on it. Elaine*, Julia’s mom, told me that aside from immediate family, they represented the second shift of relatives in South Korea. A different group of aunts and uncles had come out for the slopestyle competition earlier in the games. Add in a childhood friend who now lives in Seoul, and 17 friends and family members cheered Julia on at her first Olympics. News cycles turn over fast at the Olympics and so many more salacious scandals have come and gone that no one would blame you for having forgotten the high winds that wreaked havoc on the slopestyle event early in the games. Those winds were very much on the Marinos’ minds as their daughter geared up for big air. The winds had led to the cancellation of the event’s qualifying round, and were still swirling and gusting when the two-round final began. 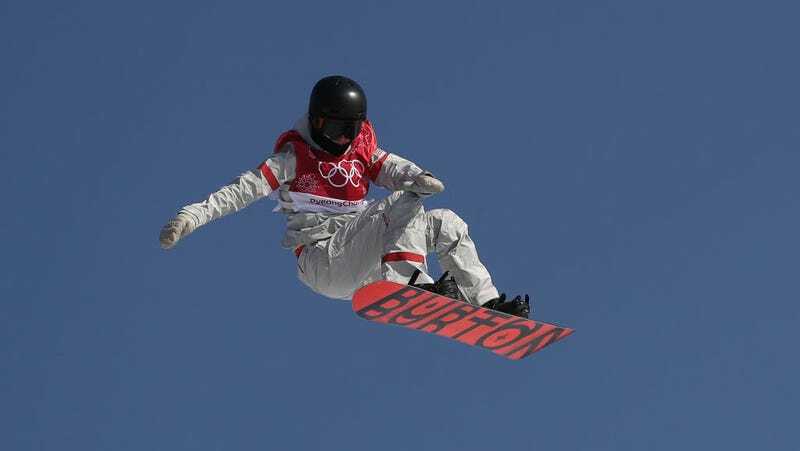 The conditions were bad enough that a ski event scheduled for the same time was postponed, but the slopestyle went forward and ultimately came down to a contest of which riders could stay upright through the course. It’s usually Julia’s best and favorite event; she’s ranked second in the world. She fell on both her Olympic runs in the bad weather, as did many others. She was disappointed to miss the opportunity to even attempt her more impressive tricks. Her parents were mostly nervous she’d get hurt. “I don’t think it should have been happening,” her father John concluded. There’s a version of the story in which this is the beginning of something—deprived of a fair shot to show off for women’s snowboarding in slopestyle, a rising star steps up her game in the debut big air event. It’s not the most far-fetched story, either: Julia is ranked fifth overall in big air, and a medal would be a reach but not unreasonable. Covering the Olympics in a comprehensive way is impossible, which means that, for a reporter, it’s an exercise in arbitrage—you gamble on where you think the next story is going to come from and try to get unique access to it ahead of time. The favorites and media darlings of the games are largely predetermined before the Opening Ceremony, which means there’s no better journalistic coup than betting correctly on an upset. I made my bet on Julia and the Marinos. If she medaled, I was going to be there to see it from her parents’ perspective. If not, I’d...still be spending a lot of time with her family. The Marinos are recreational skiers. Growing up, they’d take Julia and her younger sister Cece out west on school breaks. During one of those trips, when Julia was 12, her skis broke. Rather than rent her a new pair for the week, her dad suggested that she try the snowboard they’d brought. Julia, who was already a strong soccer player, got so good so quickly on the slopes that her snowboard skills quickly outstripped both her expectations and her parents’ understanding of the circuit. John talks about the time when Julia’s coach told her about an upcoming slopestyle competition, “and she’s so new that she didn’t know if he wanted her to watch the competition or participate!” She was 13 at the time, and John estimated that Julia had only been on a snowboard 20 times before then. She came in second place. Elaine has a story from later that same year. The family had gone to a snowboard cross event and tried to leave to get lunch after Julia’s run—until another parent informed them that she hadn’t even competed yet, that had just been the time trial. They stayed, and Julia won the whole thing. While their daughter mastered a strange and dangerous sport, her parents worked on figuring out what it was. The big air qualifiers, which took place on a still and sunny morning, cut down a field of 26 snowboarders to a top 12 for the finals based on their best scores out of two runs. Early in the day the Marinos were feeling confident about Julia’s scores, which were in the mid-80s. But as the morning wore on, one woman after another started besting her, pushing Marino down in the ranks towards the cutoff for advancing. Julia was playing it a little safe, but she did so because she was at a disadvantage. She had been sick earlier in the week and missed the first two of three practice days on the course. “They were testing her, they had to quarantine her right away,” John said. I asked them if it was norovirus and her parents weren’t sure. Over 1,000 Olympic personnel were sidelined with norovirus early in the Games but the only confirmed cases among the athlete population were on the Swiss ski team. An American athlete with norovirus would have been a big scoop, especially if she recovered just in time to compete, and especially if she won. As it turns out, however, Julia just had the flu; the PR flack for U.S. Snowboard denied she was even in quarantine, although her parents later confirmed it to me. This was a tough break for Julia Marino, and a much luckier one for a reporter. It’s the sort of adversity that works its way into an ultimately triumphant narrative. At the end of the qualifiers, Julia had performed well enough to advance to the finals. The story was alive. Julia’s mom likes to say that what made her daughter so successful was the family’s conscious effort to keep her life as normal as they could. Even as Julia’s snowboarding became increasingly all-consuming, she attended her same Connecticut high school for as long as possible. When that was no longer feasible, they made sure one parent was always living with her. But really what made her successful, beyond her tremendous athletic talent and hard work, was her parents’ ability to provide for an abnormal life. John is a financial advisor for Morgan Stanley and Elaine is an international tax consultant. Both are able to work remotely. When the east coast could no longer accommodate Julia’s need for increasingly challenging slopes, they were able to rent a place in Colorado where Julia and either her mom or dad, depending on the year, would live for the winter. It was a sacrifice, but it was also one they were privileged enough to make. It’s sound enough reasoning since it paid off and, by all accounts, Julia has come to appreciate what her parents had done for her. Now that she earns her own money, the 20-year-old gives 10 percent of it back to her sister Cece’s college fund. And there she was at the Olympics—taking advantage of the opportunities her parents afforded her. Some version of this story holds true of many Olympic athletes. It’s the exceptions that are usually worth noting. The night before the big air finals—which were moved up a day based on the forecast because FIS and the IOC had learned their lesson—John sent Julia a poem that a friend back home had written for her. Then he called her and they read it together over the phone. It was the kind of support that money can’t buy. The Marinos had that in spades, too. The top 12 women each took three runs off the ramp, performing a single trick in the air; the best two were combined for their final score. The competition served to showcase how far women’s snowboard has come in the past few years—many of these tricks would have been unprecedented even at the last Olympics. After Julia fell on her first run, John started strategizing about exactly which tricks she would need to execute in order to keep pace with the top riders. Beyond any individual performance, the theme of the day was the demonstrable progression of the sport. The widespread introduction of airbags into training has made it possible for women to safely master the air awareness necessary for bigger and riskier tricks. When Julia first burst on to the pro scene, her inversions in the air set her apart, but in Pyeongchang nearly every competitor that made it to the finals incorporated off-axis flips. “Well, that’s not what I would have done,” John said. The degree of difficulty was enough to keep her in the running, if just barely. With her final chance approaching, Julia’s cousins pulled out their calculators to work out exactly what score she’d need to end up on the podium. It would take a huge trick to catch the top riders. Elaine tried to calm her nerves, laughing adoringly at Julia’s video portrait playing on the jumbotron at the base of a 160-foot tall ramp—it’s the biggest in the world—that was about to launch her daughter into the air for a go-big-or-go-home chance at an Olympic medal. “She’s so cute!” Elaine exclaimed to me. And then Julia was off, rocketing down the steep slope and Elaine wasn’t talking to me anymore. “Oh honey, you can do it Jules, you can do it, come on baby,” she whispered to herself. But the run was over in an instant. Julia attempted a trick she had never tried in competition before and came up short—stumbling into the snow high on the landing hill for a score in the teens that would leave her with a 10th-place finish. The story of Julia Marino’s Olympic experience does not end with a medal. On a couple of February days in South Korea she competed alongside the best in her sport and wasn’t quite good enough to have her name and narrative splashed across NBC broadcasts. She wasn’t bad enough, blessedly, for a botched performance to go viral. She didn’t suffer a gruesome injury or say something inflammatory. She did pretty well, but not as well as she’d hoped. She didn’t overcome inauspicious odds or break any barriers to make to Pyeongchang, either. Julia is a pretty white girl from Connecticut with likable and supportive parents who work white-collar jobs and just wanted to see their daughter do what she loves. At 20 years old, she’s generous and well-spoken, an advocate for the sport more than for herself. She is, in other words, your average winter Olympian—a group of nearly 3,000 people who are only average when they’re all together. *CORRECTION: This post originally misstated Julia Marino’s mother’s name. It is Elaine, not Eileen.